Workers with A1 Tree Service are shown Friday at the Highland County Courthouse removing the second of two large Ash trees that county commissioners decided to take down over concerns about the Emerald Ash Borer. 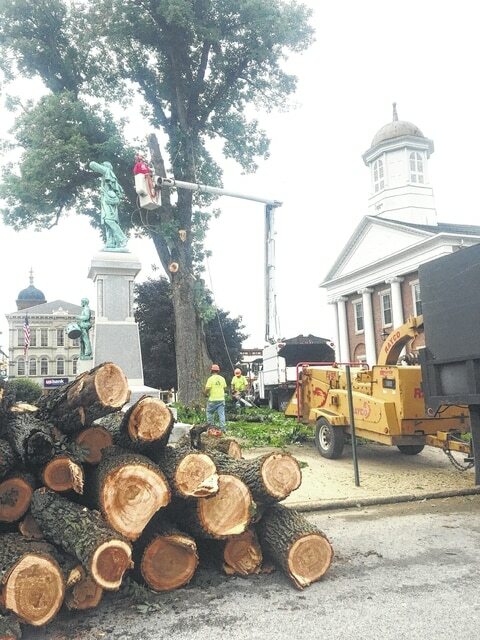 Two large Ash trees that have stood for centuries were removed Friday from the front lawn of the Highland County Courthouse. EAB kills ash trees within three to five years of infestation, according to the agriculture department. It is “an ash tree-killing insect from Asia (that) was identified in Ohio in 2003. The department has been battling the pest through detection, regulation, and public outreach in an attempt to protect the state’s more than 3.8 billion ash trees over the past decade. The pest has since spread from the initial detection in near Toledo to nearly all other parts of the state,” according to the ag department website. “We were told it was in the area,” said Horst. Commissioner Jeff Duncan said Friday an arborist who examined the trees felt that one was already infected and the other was highly susceptible. “The bark was already coming off one of them,” added Horst. So on Friday morning, workers with A1 Tree Service began the day-long process of toppling the trees. The trees’ removal will dramatically alter the landscape of the courthouse’s front lawn. The local county courthouse is the oldest courthouse in continuous use in Ohio, and its picturesque setting is often used as an image to represent Highland County. Horst said the decision was made to remove the trees based on the advice of arborists who examined them. He said concerns over liability and property damage if one of them fell on its own played into the decision. Horst said the mulch that remains after the trees are ground up will be used as top soil for grass which will be planted where the lawn was damaged by the removals. He said that for now, another tree will be planted on one side of the lawn, but the county will await the city’s decision on building a plaza adjacent to the courthouse where Governor Trimble Place now exists before deciding whether to replace the other tree. He said a decision has not yet been made on what kind of tree to plant.